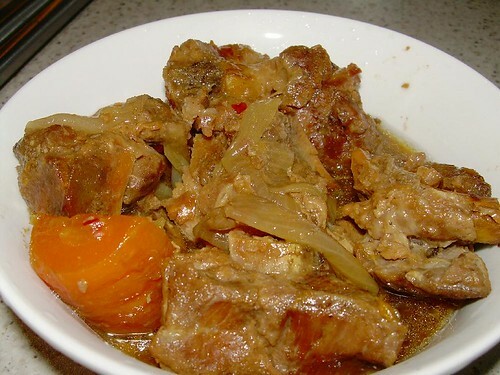 This is a dish cooked in a slow cooker without adding water. I mustered courage to cook this dish after Babe_KL did her version. The first version I read about was from Food Haven. The marinade used by both of them are different from mine as I was keen on experimenting with something new. Cooking pork ribs in a slow cooker appears easier than it sounds. There is no fear of the slow cooker (also known as Crockpot) cracking even though no water is added to the cooker prior to or during cooking. The meat and vegetables will provide the necessary juices to make the dish moist. Since no water is added, you can bet that the gravy will turn out really flavourful! And the meat is so tender that it just slips off the bone. Yummy! Marinate the pork ribs for at least 1 hour. The longer the better. Lay onions and carrots on bottom of slow cooker. Then, lay pork ribs on top of the onions and carrots. Turn on slow cooker to high for 3 hours. If you have left over marinade, baste the ribs halfway through cooking. I love using slow-cooker for such a dish too! The gravy always comes out so flavorful! Yum yum! great! another variation. i drank up all the gravy haha cos I find them lighter. babe_kl : Rice tastes great with the gravy! I wonder if we were to marinade the ribs with curry powder and such and it will turn out curry ribs??? LOL! Do I hv to blanch the pork first? before marinating? Bee : I did not blanch the pork first when I cooked this. I marinated the raw meat and then placed them into the slow cooker. I did, however, pat dry the meat to remove excess water (from rinsing) prior to marinating. Thanks, one more question, can I put low for 6 hours instead of high for 3 hours? Cos I am working, if I put low by the time I reach home, the ribs will be ready? I had tried, cooking for low for 6 hours! but my meat weigh abt 800 grams using 2 carrot & 2 big onion. I also add ‘some’ water. As my hubby is at home he can help me to monitor, so everything turn out fine, my hubby & son like it! but I think abit too watery …. usually I prefer the gravy to be thick, so next time I wont add water at all! I am quite tempted to try the crock pot method. Since the 3rd green light given by you, here I come! I remember my SIL (Ai Lay) version, she put the szechuan vege, using duck. Nice. Been looking forward to that dish every CNY. love your blog!!! great interesting recipes esp the crock pot ones. really helped me. am so lazy to cook n the oil splattering always puts me off. i tried the above recipe w chicken breast, tigh n drumsticks.on top of your recipe i added green apples, and abit of oyster sauce. it came out really nice…the chicken is so soft. may try adding abit of orange juice next time to give it a tangy twist. thanks again for sharing! I tried your Pork Ribs in Plum Sauce recipe with my crocpot and indeed they turned out tender and great but somehow with that little worcestershire sauce and pinch of salt, I find the whole dish abit too sweet. Dont you think I could reduce the plum sauce and sugar and add soya sauce instead? I just tried your recipe and the dish turned out very yummy! After reading donna’s comment, I added a bit more salt to a mixture of plum sauce, Worcestershire sauce and sugar and did a taste check before pouring the marinade to the meats. Then I add the rest of the ingredients for marinating directly to the meats. Honestly, I had my doubts too as no water was required. And I was really glad that the meats turned out flavourful and tender with vegetables nicely softened and plus some delicious gravy formed! This dish goes well with blanched xiao bai cai in oyster sauce. Hubby loves it too. Thank you so much for sharing!